Can Sony's compact DSLR create a shift in high-end consumer photography? 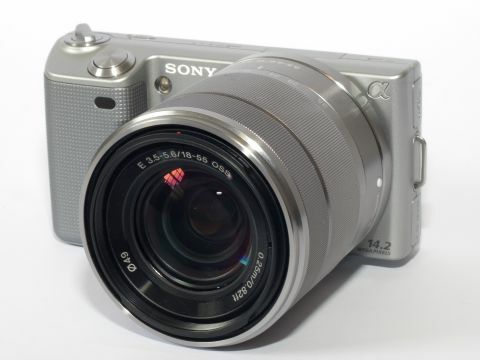 The 14.2-megapixel Sony NEX-5 is cut from a different cloth to most Electronic Viewfinder, Interchangeable Lens (EVIL) cameras. That much is true as soon as you pull it out of the box – impressive-looking beasts such as the Nikon D3S aside, there may not be a better-looking camera available today. The NEX-5 essentially looks like a wide compact with a DSLR lens grafted onto the front of it – which isn't far off what it is. But looks aside, the NEX-5 could represent a sea-change in consumer DSLR photography. Inside the 110mm-wide body sits a comparatively huge sensor: at 23.4 x 15.6mm, it's an APS-C format sensor. That's the same size and format as you'll find in every sub-£1,000 DSLR. So, in theory, Sony has produced a gorgeous-looking camera that takes images as good as those from a proper DSLR, without the accompanying size and weight. Those are the headlines, but the NEX-5 has plenty more to offer serious photographers. There's a 1080i HD video mode, as well as Sony's sweep panorama feature, which allows you to quickly stitch together a multiple-frame image without needing to dig into the software. Naturally, there's a fully manual mode, accompanied by shutter and aperture priority modes. Best of all, the NEX-5 is a camera with some serious headroom for those learning the photographic ropes. It may come with a standard-spec 18-55mm, f/3.5-5.6 kit lens, but you can buy the 16mm, f/2.8 "pancake" lens (around £200), or the rather slow-sounding 18-200mm f/3.5-6.3 superzoom (around £700). Alternatively, £149 gets you a mount adapter that enables you to use any of Sony's A-mount lenses.